Atlas model trains started out as Atlas Tool Company, which was founded by Stephen Schaffan Sr. in 1924. The owner of the company did what any other small business owner of the day would do and asked his teenage son to work in the family store. Stephan Schaffan Junior had a different passion in life. He enjoyed making model airplanes and as such, spent a lot of time at the local hobby shop. In order to try to make some extra cash, the young man continuously asked for something to do in the shop. His hope was to be able to work with the materials he enjoyed the most and make money in the process. What Steve Junior did not know was he was becoming a major annoyance to the shop owner. In an attempt to pacify the child, the hobby shop owner gave him some track to play with. He told Steve Jr. that he should see what he could do to improve the track. As Steve set to making a better track, the shop owner simply enjoyed the peace and quiet he was getting. What happened was the birth of the switch kit. 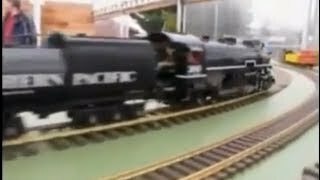 This was a revolutionary invention in the world of model trains because up until that time, everything for model trains was built by hand.